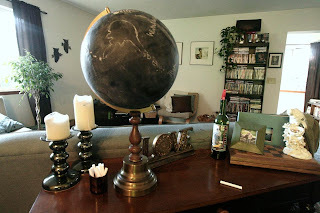 I just recently purchased this awesome chalkboard globe off of Etsy made by Nicole & Jesse of confettigarden after seeing it featured in Etsy Dudes (Newsletters).﻿ Jake and I both enjoy doodling all over it and I think I will be using it at local festivals as signage and I’m sure I will get a lot of customer asking if it is for sale. Doesn't it look great in our living room?? Front Page of Etsy "a nice time"
Front Page of Etsy "Country Cottage Chic"
Alaska Sunset Photo Series "Sailors Delight"
iPhone Fine Art Photography "Growth of a Tree"
Front Page Of Etsy "capsized"
iPhone Fine Art Photography "My Dream Car"
Front Page Of Etsy "Revamp"
Front Page Of Etsy "Little Doodads"
iPhone Fine Art Photography "Rain or Shine"
Front Page Of Etsy "Weekend Favorites"
iPhone Fine Art Photography "Our Boots"
Front Page Of Etsy "Country Day Dream"
iPhone Fine Art Photography "﻿What Is Art?"